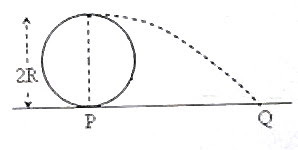 mv2/R = mg where m is the mass of the plane (with the pilot), R is the radius of the circle and v is the speed of the plane at the topmost point. Therefore, v = √(Rg) = √(1000×10) = 100 ms–1. The magnitude of the torque is τ = rF sin 90º, since the force is to be applied perpendicular to the plane of the door to produce maximum torque (so that the applied force is minimum). 0.8×50 = 0.2×F where F is the force required to open the door by pushing at a point distant 20 cm from the line of the hinges. This gives F = 200 N.
The centre of mass of the wheel is moving with speed u. The pebble at the topmost point of the wheel is moving horizontally with speed u with respect to the wheel so that the horizontal velocity of the pebble with respect to the ground is u+u = 2u. In the next post we will discuss questions in this section solely for the benefit of AP Physics C aspirants. Example isn't another way to teach, it is the only way to teach.